A dual Gr.1 winner of 10 races and more than $1m and a grandson of breed shapers Sunday Silence and Storm Cat, Trust in a Gust retires to Swettenham Stud at Nagambie in 2016. The talented performer looks certain to prove popular with breeders looking for a sire who will produce SuperVOBIS stars. Dual Gr.1 winner Trust in a Gust, who retires to Swettenham Stud, Victoria on a $12,500 fee in 2016, certainly earns bragging rights when its time to talk about pedigrees. Not only is he by a son of Kentucky Derby winner and Japanese super sire Sunday Silence, but his dam, a three-quarter sister to an English Oaks winner, is by a US champion sire Storm Cat. You don’t get much better than that. A $45,000 Inglis Premier Sale buy in 2012 and with earnings of $1.13m from 10 wins, five seconds and a third in 23 starts when trained for a big syndicate of owners by Darren Weir, the handsome chestnut is a dinky die Aussie, despite his international pedigree. His record shows just how suited he was to our style of racing. He was beaten “a lip” on debut at two in the $280,000 Bendigo Gold Rush (1000m) when a dead-heat second with Hard Stride behind Iconic and then third in Melbourne behind Weinholt at his only other start as a juvenile. He resumed mid-September and broke his maiden by four lengths over 1009m at Echuca, running 59.22 on a dead track and won again at Stawell (1309m) two weeks later before heading to town for a fourth in the Listed Gothic Stakes behind subsequent Gr.1 winner Hucklebuck. 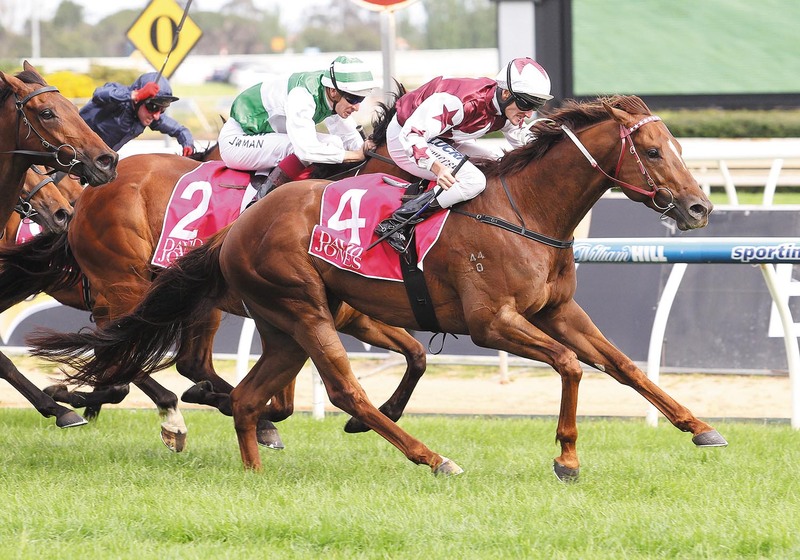 Trust in a Gust (Keep the Faith-Subtle Breeze (USA) by Storm Cat) then won his next four starts between November 24, 2013 and January 24, 2014, scoring over 1300m at Bendigo (1.5 lengths), then in the $128,000 VOBIS Gold Eureka Stockade, 1400m at Ballarat by 2.75 lengths, the MRC VOBIS Gold Carat (1200m) and the MVRC Chandler Macleod Stakes (1500m) carrying 60kg on a dead track and beating Written Up by 1.25 lengths. He chased more VOBIS riches in the $100,000 El Dorado (1300m) on March 2 and was a narrow second to Worth a Ransom before a sixth in the Bendigo Guineas-LR and then a second to Worth a Ransom in the $280,000 VRC VOBIS Gold Reef (1600m) on April 5. Another purple patch of form followed when he resumed as a four year-old on August 23 with a win at Moonee Valley (1200m in 1:10.81), a second in the MVRC Chandler Macleod Stakes-LR on September 6, a 2.25 length win over Gr.1 winner Lucky Hussler in the MRC Le Pine Funerals Handicap (1400m) on September 20 and then his first Gr.1 win in the Sir Rupert Clarke Stakes (1400m) beating multiple Gr.1 winner and Horse of the Year Dissident and Bull Point in 1:23.00 on September 28. The top form continued next start when he won the MRC Toorak Handicap-Gr.1 (1600m in 1:35.2), beating Speediness and Desert Jeuney on October 11, to be the first horse since Barely a Moment in 2005 to complete this big race double. “He puts himself in the race on the corner and toughs it out in the straight. He’s a pleasure to train. We always knew he was quite a good galloper but to get to this level was a surprise,” Weir said after the Toorak. “We brought him in for the spring not knowing where we were going to end up but it’s been a great ride so far. It took us a long time to win a Gr.1 (in Victoria) and now we’ve got a couple with a great little horse. A minor leg injury after the Toorak ensured Trust in a Gust had just two runs in 2015 including a narrow second to Red Bomber in the $180,000 MRC VOBIS Gold Sprint and he was retired after four mid-field runs between January and March 2016. With his 17 first four placings in 23 starts and earnings of $1,170,150 highlighting his consistency, he should be a great asset for Victoria. Arrowfield’s John Messara has always been a great fan of Sunday Silence (Halo-Wishing Well by Understanding) and obtained several southern-time breeding rights to the horse over a few seasons, sending mares to Japan and then bringing them to Australia to foal down. Keep the Faith (ex Duelling Girl by Dayjur), a stakes winner in Australia and stakes placed in the US and foaled in 2000, is one of the horses born as a result of Messara’s bold plan. He was bred in partnership with the late Sheikh Maktoum bin Rashid Al Maktoum’s Gainsborough Stud Australia. From just 28 foals this Sunday Silence experiment produced 20 who remained in Australia including Australian Oaks winner Sunday Joy (dam of multiple Gr.1 winner More Joyous), black type producers Sunday Service and Sunday Valentine and stallions Silent Action, Sunday Knight and short-lived Any Given Sunday, along with Keep the Faith, who began his stud life at Adam Sangster’s Swettenham Stud in Victoria in 2006 and now stands at John and Laurie McCarthy’s at Greta West Stud. It’s hardly surprising that the Arrowfield principal was so keen on Sunday Silence, as he was a superb racehorse and sire, winning the Kentucky Derby-Gr.1 and Preakness-Gr.1 in 1989 and running second behind Easy Goer in the Belmont before beating that horse in the end of season Breeder’ Cup Classic-Gr.1. He won nine of 14 starts and was five times second, earning $4.68m, before his sale to Japan’s Zenya Yoshida (Shadai Stallion Station) and topped the sires’ list in that country from 1995-2007. He died in August 2002. Messara shuttled undefeated champion two year-old Fuji Kiseki (JPN) (Sunday Silence-Millracer by Le Fabuleux) between 1998-2002 (321 foals), his best here being South African and Dubai Gr.1 winner Sun Classique and also had a hand in shuttling Gr.1 winner Bubble Gum Fellow (JPN) (ex Bubble Company by Lyphard), sire of NZ Gr.1 winner Rockabubble and Craiglee Stakes-Gr.2 winner Confectioner, in 1999-2000. His love affair with the line continues in 2016 when he shuttles the Japanese and Australian Gr.1 winner Real Impact (JPN) (Deep Impact-Tokio Reality (USA) by Meadowlake) whose sire, a son of Sunday Silence, has inherited his own sire’s mantle as the champion stallion in Japan. Real Impact’s two Australian starts in March and April 2015 resulted in a win in the George Ryder Stakes-Gr.1, beating Criterion, and a second to Kermadec in the Doncaster Mile-Gr.1. The breeding of Trust in a Gust is all down to Adam Sangster who stood Keep the Faith when he retired to stud in 2006 after a career of 12 starts that netted five wins and two thirds, the best of his wins being the MRC Schweppervescence Cup-LR (1600m) at Caulfield and he was also fourth in the Canterbury Guineas-Gr.1. He was Gr.2 placed in the Kelso Stakes and won an Allowance at Belmont in three starts in the US as a five year-old. He ran 1:06.82 in his 6f win at Belmont, wining by 2.5 lengths and set a new US turf record for the distance. Keep the Faith’s winning dam is a three-quarter sister to Gr.2 winner Always Fair and Listed winner Asaasy (both by Danzig) and half-sister to Gr.2 winner and Gr.1 runner-up Faithful Son (Zilzal). Her sire Dayjur (Danzig-Gold Beauty by Mr. Prospector) was a Horse of the Year in Britain and Champion European Sprinter with wins including the Prix de l’Abbaye-Gr.1, Nunthorpe Stakes-Gr.1 and Haydock Sprint Cup-Gr.1. 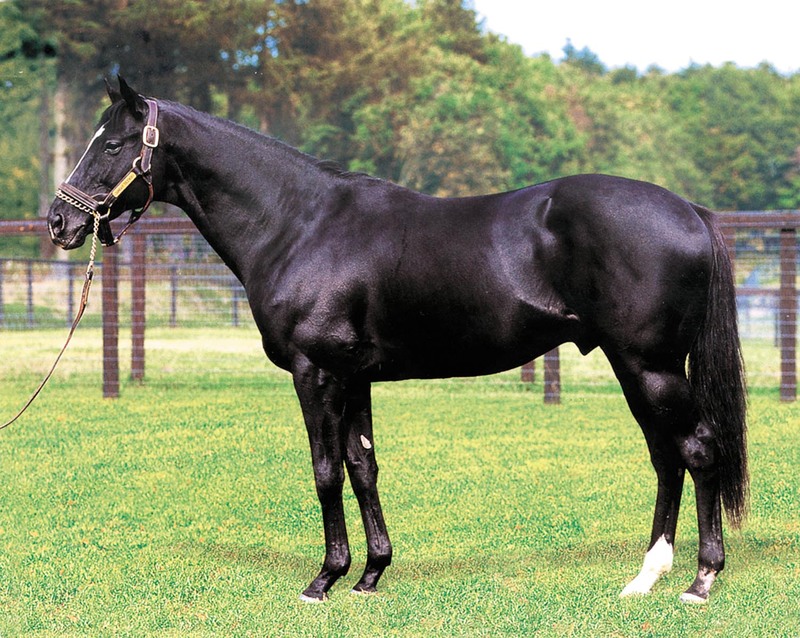 Although he died young, he has become a noted broodmare sire and is bred on the Danzig/Buckpasser cross, similar to nine-times Australian Champion Sire Danehill (USA) (Danzig-Razyana by His Majesty). Golden Slipper winner Flying Spur (Danehill-Rolls (USA) by Mr. Prospector) is bred on a similar cross to Dayjur and his daughters could be a good fit with Trust in a Gust. His sire has already produced Listed winner Lucky Penny to a mare by Flying Spur (that mating doubling Danzig 4mx4m, Buckpasser 4fx6f, Mr. Prospector 5fx4f and Round Table 5fx5m). Keep the Faith had had 180 winners from 268 starters (67.2%) for progeny earnings topping $10m and his six stakes winners (2.2%) also include Gr.3 winner Dinkum Diamond (Deveraja), Socks (by Storm Bird son Mukkaddamah), Lucky Penny (Flying Spur), Honey Steel’s Gold (by Encosta de Lago, whose second dam is Rolls) and Soldi Domani (Bel Esprit). There are stakes placed runners out of daughters of Danehill, Encosta de Lago (2), Anabaa (by Danzig, 2) and Dash For Cash. His progeny have a winning distance index of 1325m. The pedigree of Dinkum Diamond is an interesting one as Dayjur’s third dam Minstrelete is by Round Table and from a daughter of Sir Gaylord, while Devaraja’s sire Sir Tristram (IRE) is by a son of Sir Gaylord and from a daughter of Round Table. 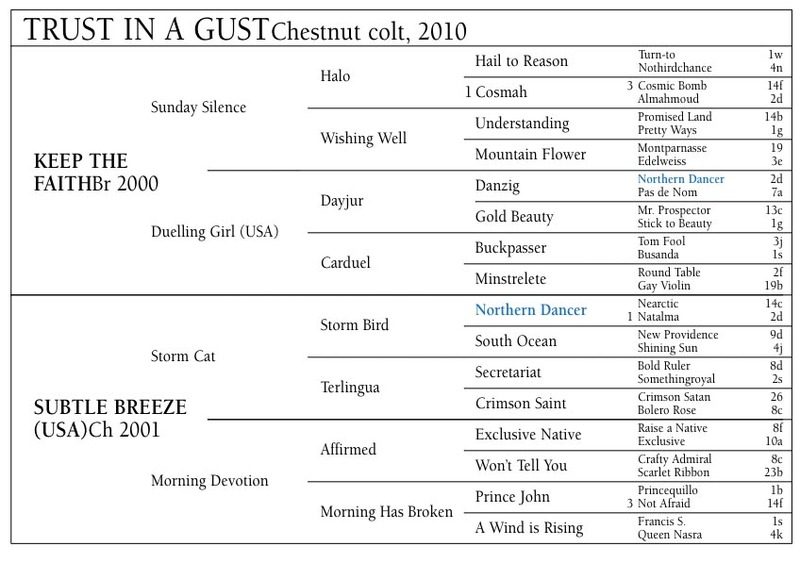 This suggests further use of the Sir Tristam line across Trust in a Gust could be prudent (especially as Storm Cat’s dam is by Secretariat, a half-brother to Sir Gaylord), maybe using daughters of Lonhro or his short-lived brother Niello. Their dam is by a son of Mr. Prospector and doubling this horse also seems to work with Keep The Faith. Keep The Faith’s stakes winner from a daughter of Royal Academy son Bel Espirit is worth noting as a similar mating with Trust in a Gust should be even more powerful. Storm Cat’s second dam Crimson Saint is the dam of Royal Academy and Storm Cat’s sire Storm Bird and Royal Academy’s sire Nijinsky share many common ancestors. Of course Royal Academy (grandson) and Storm Cat (son) are from the Northern Dancer male line, a proven nick with Halo, whose dam Cosmah is a half-sister to Natalma, dam of Northern Dancer (and third dam of Danehill). The dam of Trust in a Gust arrived in Australia after Adam Sangster went to the dispersal of his late father Robert’s bloodstock interests at Keeneland in Kentucky in November 2007. Through agent Adrian Hancock (Hancock Quality Bloodstock) he went to $US140,000 to purchase the young Storm Cat mare Subtle Breeze (USA), who was bred by his father, and she arrived in Australia in early 2008. She was covered by Soldier’s Tale (USA) (by the Nureyev son Stravinsky (USA)) later that year. Subtle Breeze is a three-quarter sister to one of the great fillies bred by Robert Sangster in Balanchine (Storm Bird), winner of the Irish Derby-Gr.1, English Oaks-Gr.1 and runner-up in the 1000 Guineas-Gr.1 for Sheikh Maktoum Al Maktoum (but racing for Godolphin) who purchased her privately at two. She was rated Champion European Three Year-Old in 1994. Their dam, stakes placed Morning Devotion (by Raise a Native grandson Affirmed from Morning Has Broken by Prince John) also produced, to covers by Nureyev, the Gr.2 winner Romanov and Red Slippers (dam of French Oaks winner West Wind by Machiavellian and Listed winner Redbridge by Alleged). Eastern Joy, another daughter of Red Slippers, is the dam of Group winners Ihtimal (Shamardal) and First Victory (Teofilo). Trust in a Gust’s fifth dam is the Nasrullah mare Queen Nasra (ex Bayborough by Stimulus). Morning Devotion’s unraced daughter Humble Devotion is the dam of Group winner and producer Humble Eight, while First Night (Sadler’s Wells), a stakes placed daughter of Morning Devotion, is second dam of imported 2016 Doncaster Prelude-Gr.3 winner and The Metropolitan-Gr.1 third Havana Cooler (IRE) (Hurricane Run). This is also the family of Gr.1 winners Art Connoisseur and Saoirse Abu and Japanese Gr.2 winner and Gr.1 placed Shonan Mighty (by Sunday Silence son Manhattan Café). Morning Has Broken is a half-sister to US multiple Gr.1 winner and Joint Champion US 2YO Filly of 1978 It’s In The Air (Mr. Prospector-A Wind is Rising by Francis S.), dam of French Gr.2 winner Bitooh (Seattle Slew). This is family 4k, whose members also include Gr.1 winner Alverta (Flying Spur), whose third dam is It’s In The Air, and US and European Gr.1 winner Storming Home (Machiavellian). John Messara sent Alverta to Japan in 2015 where she was covered southern time by Horse of the Year and champion sire Deep Impact before return home. She has already had a filly by another Halo-line horse in More Than Ready (USA) in 2013 and this youngster will race in Japan. The Soldier’s Tale-Subtle Breeze mating produced a filly, Down to Luck, unplaced in two starts and now a broodmare for Adam Sangster, so far producing colts by Kaphero and Keep The Faith before a cover by Master of Design in 2015. Subtle Breeze, whose sire Storm Cat (Storm Bird-Terlingua by Secretariat) was a Gr.1 winner before becoming Champion Sire in the US, produced Trust in a Gust in 2010, slipped in 2011 and then foaled colts by Equiano (FR) (The Show Goes On), Master of Design (Artistic Design) and Pierro, before producing a filly by Equiano in 2015. Subtle Breeze is also dam of the Elusive Quality (USA) gelding Seachantach (USA), foaled in 2006 and winner of four races in Ireland and the UAE. The Halo line has been successful in Australia, particularly through Vinery’s wonderful stallion More Than Ready (USA) (Southern Halo-Woodman’s Girl by Woodman) and that branch of the line now continues via that horse’s Golden Slipper-winning son Sebring (ex Purespeed by Flying Spur). Given the success of eight-times Gr.1 winner More Joyous (by More Than Ready from a daughter of Sunday Silence and carrying Halo 3mx3m) and my earlier comments about Flying Spur, it would be no surprise to see daughters of Sebring (Mr. Prospector 4mx4f) produce remarkable results when covered by Trust in a Gust (this would give Halo 4mx5m; Danzig 5mx6m), ditto daughters of More Than Ready. Courage and talent are qualities we all love in thoroughbreds and Trust in a Gust had them in spades. He won twice at the highest level and he has a really attractive pedigree. Standing on a modest fee of just $12,500 and with lifetime breeding rights available for $25,000 (including GST), he is quite capable of adding a bright new chapter to the Sangster family’s remarkable international success story.